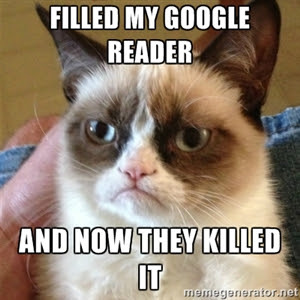 If you're like me, you might have been a little eensy weensy bit bitter that Google Reader died on Monday. Grumpy Cat even agrees with me. That was NOT KEWL, GOOGLE. NOT KEWL. Thankfully, other feed readers have stepped up to the plate and are providing us with the service we deserve. Unlike the service from someone else we know. That's right, Google. This fangirl is still a bit bitter. Yes, I know I'll forgive you in the long run and this relationship is not quite over, but be prepared for a nice long stay on the couch for now. On Sunday, I told you how to save your Google Traitor Reader feeds before they died. But let's just say that you had stuff to do. And you forgot to mark Monday as being the fateful day that Google would rip Reader from our hands. In fact, maybe you were too drunk busy celebrating Canada Day and you just plum forgot. Or more precisely, (surprisingly?) Google's got this. But yes, you can extract all of your Google Reader feeds as an XML file which you can then import to another feed reader. And the best part? It includes your categories. Now, when I tested a bunch of other readers by granting them permissions to my Google Reader feeds, none of them imported categories other than Feedly. However, with this XML export, you might be able to import the categories into the reader of your choice and save yourself a whole lotta work. But you'd better mark the date because Google Reader feeds will only be available for download until July 15th. Considered yourselves warned. Head to Google Takeout now.